The London Life series carried many echoes from my own life and family. My grandparents and parents were born in London and during my childhood London was only an hours journey by train and was a regular place for trips to explore the sights. In Fateful Shadows Casey was the daughter of a publican. In the Loveday books readers will remember that Meriel was also an innkeepers daughter and the Dolphin inn features in all the novels. We tend to write what we know and several members of my family have been publicans. For a time My great-grandmother ran an inn in St Albans. My father was the sports and social secretary on the workers estate of the Bata Shoe Factory in East Tilbury and he ran the social club and bar. A cousin of my father's ran a bar and hotel on the Isle of Sheppey, another cousin and my stepsister had bars in Kent and more recently a niece ran a popular tourist bar in Devon. Some of the pub names you may recognise from my novels. The Dolphin and The Britannia. Also the current novel I am writing has that is set on Dartmoor has an innkeeper's daughter as the heroine. Writing Fateful Shadows brought back many happy childhood memory's of the camaraderie surrounding pub life. I was however very young as my father died when I was a child so I suppose I keep a link with him alive through the lives of my heroines. Casey Strong laughed at her cousin’s outrageous words. It was so like Eva to say what was most provocative. Casey adores her older, beautiful cousin and offers her a home in their pub, The Britannia, when Eva’s father and stepmother are killed by a gas explosion. Everyone falls for Eva’s vivacious charm even Casey’s surly, widowed father Joe, who had resented providing a home for her. But Joe ‘Strongarm’ Strong is a man with a dark secret and Eva is not the innocent victim she at first appears. 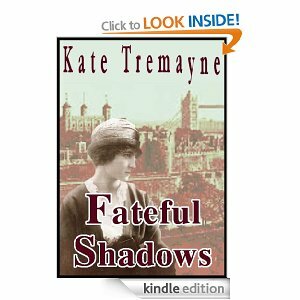 Fateful Shadows is a compelling novel of dark secrets, passion and loyalty overcoming persecution and social prejudice – and an obsessive love which leads to tragedy. ﻿My passion for writing history has always been about diverse characterisation and memorable, atmospheric settings. When beginning my London Life series during the Victorian era there was no greater master of that period than Dickens. The images of those lives and times are carved in his readers' minds. As a writer we cannot be true to characters unless with each of them the writer makes themself walk a mile in their shoes. In this series I notonly had to get the research of each setting right but to build the conflict and suspense I had to get the pyschology and motivation right. I loved writing this series and have always been intrigued by how secrets from the past can never be forever locked in their closets. When they escape the potential for the dramas they unleash is unlimited. INNOCENCE BETRAYED is the story of two sisters separated as children and raised in very different lifestyles - one of privilege, the other of squalor. Can they learn to trust and overcome past grievances and be reunited as a family, or will jealousy and resentment destroy them both? For innocense once betrayed can never be regained. Kara Wyse, the daughter of a wealthy merchant, is shocked when her father is arrested for debt and commits suicide. Her life changes drastically. Gacing poverty she also learns that the mother she had believed dead is still alive and that she was cast out of the family home by her father. Kara also learns that she has a younger sister, Beatrice, whose childhood has been very different from her own. Kara is determined that her family will be reunited and that she will survive the scandal of her father's suicide and succeed as a businesswoman. Beatrice has been brought up in poverty and squalor and to survive has become a pickpocket and the mistress of Fancy Gilbert a dangerous gangleader of the London Underworld. When Kara unwittingly marries the man that Beatrice loves, the younger woman vows that her sister will pay for all the wrongs that she has suffered by her poverty. A captivating story of survival over adverstity, the righting of past wrongs and the redemptive power of love. 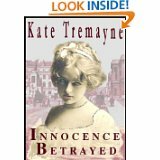 INNOCENCE BETRAYED is a fast moving and compulsive suspense novel of the diverse lifestyles existing in Edwardian London. It tells of the darker side of kinship, revenge and retribution - and the redemptive power of love.